Shale shaker is a general term for a vibrating device used to separate solids from a circulating drilling fluid. Shale shaker can be used in all drilling applications where fluid is used as the drilling mud. The work of shale shaker is finished by drilling mud through rectangular screening surface. Larger solids are removed at the discharge end, with the smaller solids and drilling mud passing through the screens into the next solid control equipment. 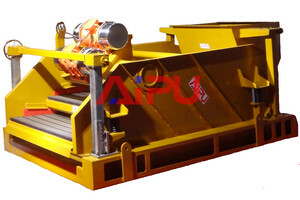 Screen selection is controlled by the circulation rate, shaker design, and drilling mud properties. Screen selection for shale shakers is also dependent on geographical and geological location. Shaker screen combinations that will handle specific flow rates in the Middle East, for example, will not necessarily handle the same flow rates in Russia. The flow area should cover from 75 to 80 percent of the total screen area at the normal drilling rate. If the drilling fluid only covers one fourth or one third of the screen, the screen is too coarse. A screen with a hole in it should be repaired or replaced at once. Holes in panel screens can be plugged. Install screens according to manufacturer’s recommended installation procedures. Cuttings are not removed from the drilling fluid flowing through the hole. Shaker screen replacements should be made as quickly as possible. This will decrease the amount of cuttings remaining in the drilling fluid because the shale shaker is not running. Locate and arrange tools and screens before starting to make the replacement. If possible, get help. If possible, change the screen during a connection. In critical situations, the driller may want to stop (or slow) the pumps and stop drilling while the screen is being replaced. For improved screen life with nonpretensioned screens, make certain the components of the screen tensioning system, including any rubber supports, nuts, bolts, springs, etc. are in place and in good shape. Check condition of vibration isolators members and screen support rubbers and replace if they show signs of deterioration or wear. Water should not be added in the possum belly (or back tank) or onto the shale shaker screen. Water should be added downstream. Except in cases of lost circulation, the shale shaker should not be bypassed, even for a short time. Wash screen at the beginning of a trip so fluid will not dry on the screen.